Sgt. 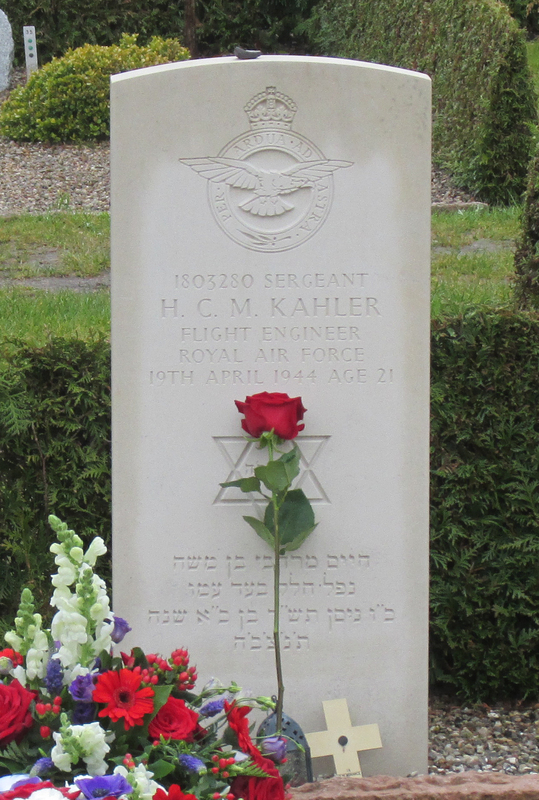 Hyman Chaim Mordecai Kahler, RAFVR 1803280 – Flight Engineer. Killed age 21 on the 19th of April 1944. Son of Morris and Rachel Kahler, of Stoke Newington, London. Seven Stirlings were detailed to lay mines in Kiel Bay, one was withdrawn and one failed to return (Captain NZ415820 F/O. H. Murray). The remaining five successfully completed their mission. On return they landed away. F/O Henry James Murray, RNZAF NZ415820 – Pilot. Sgt. John Edward Lithgow ‘Paddy’ McFarland, RAFVR 1503993 – Navigator. F/S Douglas John Hill, RNZAF NZ415761 – Air Bomber. F/S Gordon James Irwin, RNZAF NZ415698 – Wireless Operator . Sgt. John Mulligan, RCAF R.195834 – Mid Upper Gunner. Sgt. 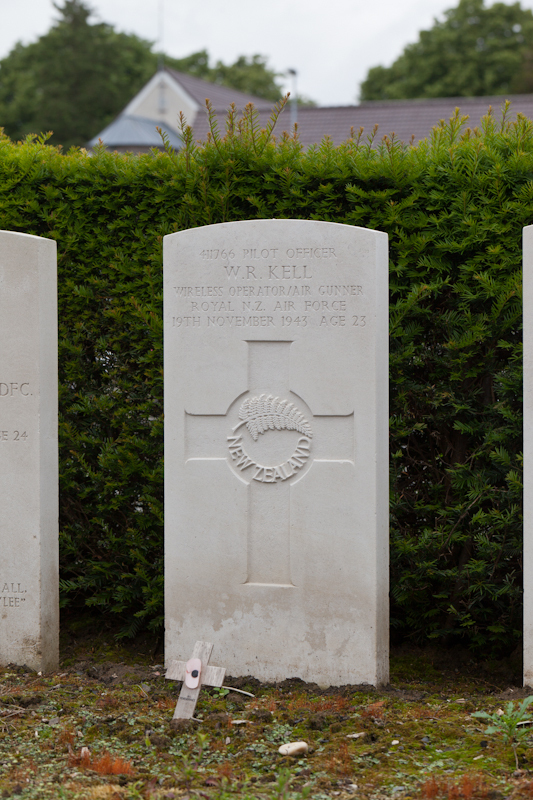 Peter Woollam, RAFVR 1890807 – Rear Gunner. By John McFarland’s own observation the decision to volunteer for the Gardening Op to Kiel in a Stirling was seen as a soft and easy extra trip to their tour…..Perhaps this decision can be understood – the crew had suffered 3 aborted Ops in a month and it probably felt to them as if their time at Mepal was never going to end – add to this a 10 day hiatus for conversion to Lancasters at Feltwell and the soles of their feet may well have been getting itchy……. 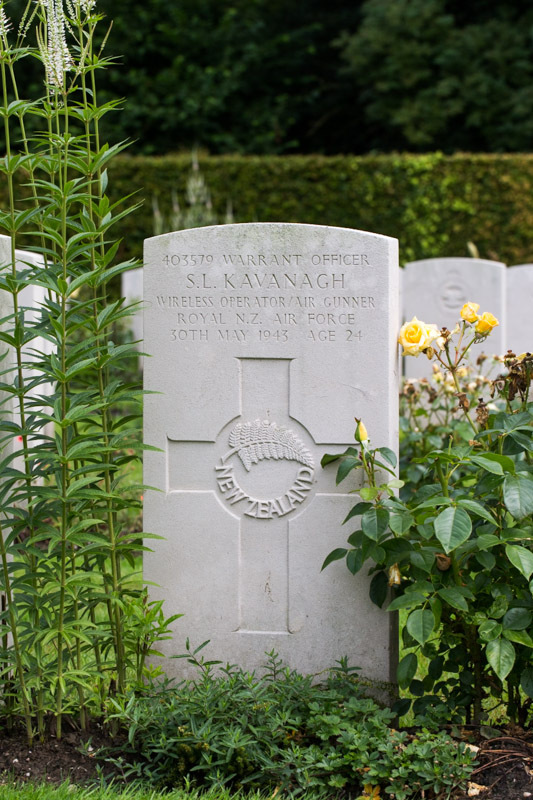 W/O Stanley Leo Kavanagh, RNZAF NZ403579 – Wireless Operator. Killed age 24 on the 30th of MAy 1943. Son of Edward Francis and Mildred A. Kavanagh, of Dunedin, Otago, New Zealand. Lost without trace age 35 on the 22nd of May 1944. Sgt. 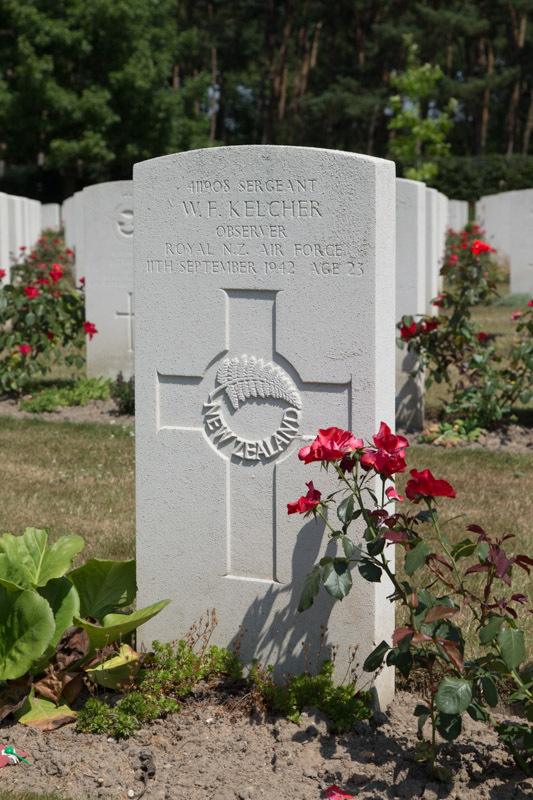 Walter Foch Kelcher, RNZAF NZ411908 – Front Gunner. Killed age 23 on the 11th of September 1942. Son of Leonard and Isabella Mary Kelcher, of Maheno, Otago, New Zealand. Grave location – 4. A. 22. 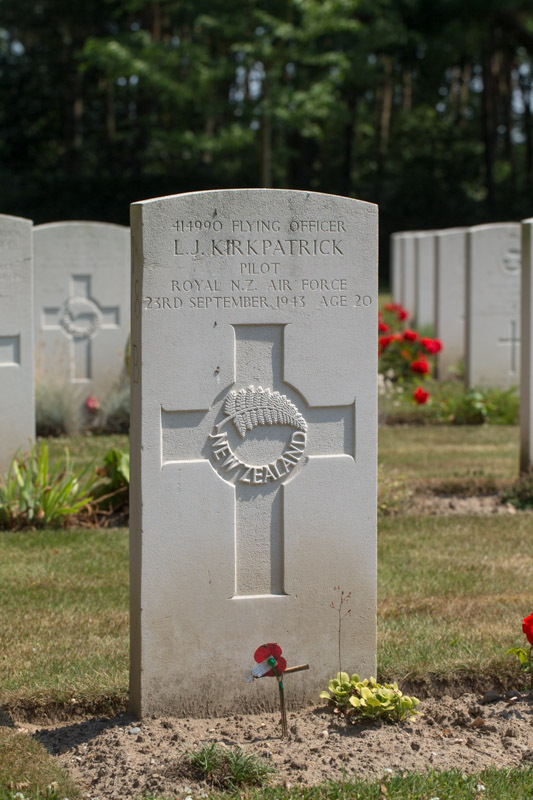 P/O William Robert Kell, RNZAF NZ411766 – Wireless Operator. Killed age 23 on the 19th of November 1943. Son of John Robert Kell and of Isabel Alice Kellnee Goodwin), of Dannevirke, Hawkes Bay, New Zealand. Grave location – Grave 24. Lost without trace age 24 on the 22nd of April 1942. Son of Thomas and Mary Margaret Kelly, of Pukekohe, Auckland, New Zealand. Sgt. 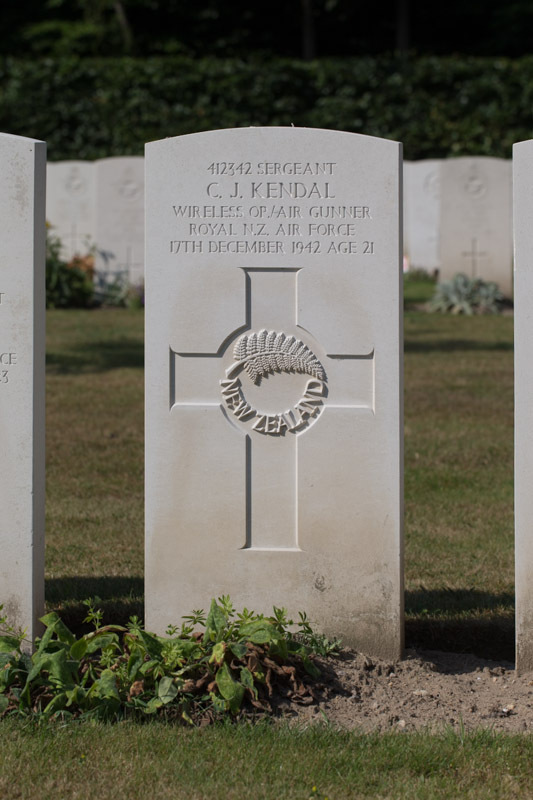 Christopher James Kendal, RNZAF NZ412342 – Wireless Operator. Son of Christopher and Edith Maude Kendal, of Napier, Hawke’S Bay, New Zealand. Sgt. 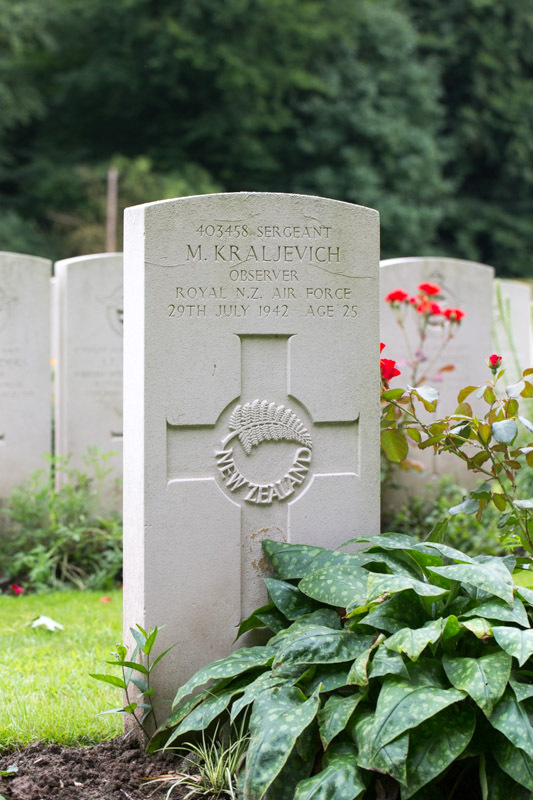 Michael Kendlan, RAFVR 1072258 – Wireless Operator . Killed age 23 on the 24th of June 1943. Son of Mary Anne Kendlan, of West Hartlepool, Co. Durham, England. Grave location – 7. AA. 6. Sgt. 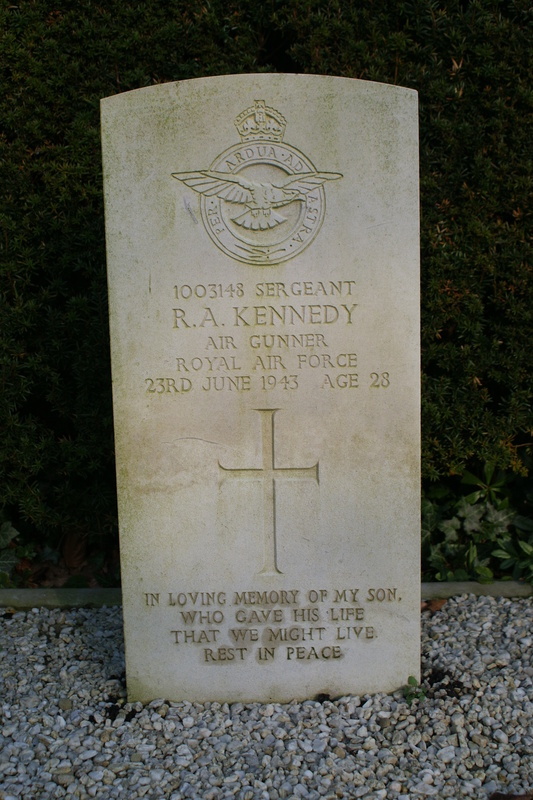 Raymond Anthony Kennedy, RAFVR 1033748 – Rear Gunner. Killed age 28 on the 23rd of June 1943. Son of Patrick Michael and Florence Ann Kennedy, of St. Marylebone, London. Buried Wieringermeer (Middenmeer) General Cemetery, Holland. . Grave location – Grave 1448. W/O George John Stewart Kerr, RAFVR 1558163 – Pilot. Son of John and Georgina Kerr, of High Ongar, Essex. Grave location – Sec. H. Grave 293. W/O Dennis Alfred Kidby, RAFVR 1391158 – Air Bomber. Grave location – Panel 214. Lost without trace age 40 on the 1st of September 1943. Son of Henry John Kilby, and of Christina Kilby, of Ngaio, Wellington, New Zealand; Husband of Alice Kilby. S/Ldr. Ronald Ernest Kimber, RAF 45956 – Observer. Lost without trace age 31 on the 11th of August 1942. Son of Ernest and Lilian Kimber; Husband of Gwendoline Mary Kimber, of Farnham, Surrey. Grave location – Panel 65. 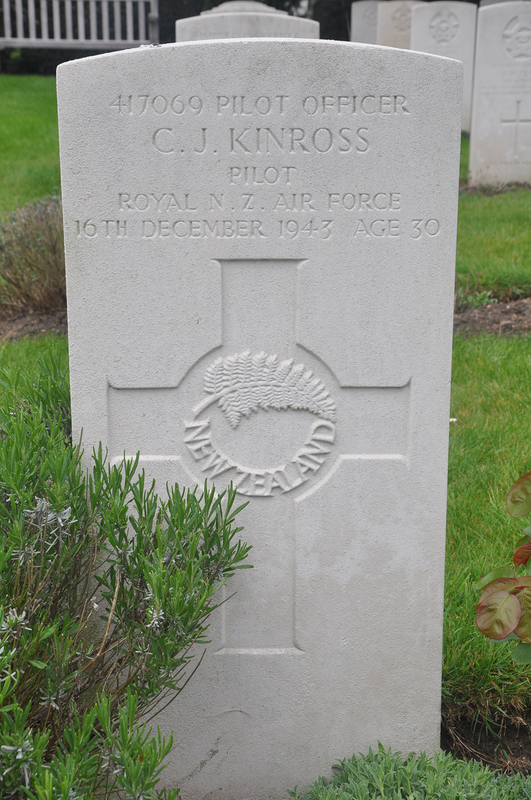 P/O Colin John Kinross, RNZAF NZ417069 – Pilot. Killed age 30 on the 16th of December 1943. Son of Lewis James Kinross and Alice Kinross; Husband of Ellie Amina Kinross, of Tauranga, Auckland, New Zealand. Grave location – Grave 14548. Killed age 20 on the 23rd of September 1943. Son of Matthew Kirkpatrick, and of Grace Kirkpatrick (Nee Woodruffe), of Gore-Waikaka, Southland, New Zealand. Grave location – 18. B. 1. S/Ldr. Peter James Robert Kitchin, RAF 39539 – Pilot. Lost without trace age 24 on the 12th of March 1942. Sgt. Stephen Tom Kitching, RAFVR 1215487 – Mid Upper Gunner. Lost without trace age 22 on the 7th of August 1943. Son of Gerald Currie Kitching and of Lily Kitching (Nee Copnell), of Leeds, Yorkshire. F/S Ronald Knapton, RAFVR 1681317 – Flight Engineer. Son Of Harry And Dora C. Knapton, Of South Crosland, Yorkshire. Grave location – Panel 219. Lost without trace age 22 on the 9th of June 1942. Son of Francis and Juanita Dallinghoe Knight, of Mount Roskill, Auckland, New Zealand. Killed age 25 on the 29th of July 1942. Son of Steve Kraljevich, and of Ivy Kraljevich (Nee Royal), of Waiuku, Auckland, New Zealand; Husband of Margaret Kraljevich, of Waiuku.